This week I lost two things that are important to me. First, my credit card. Second, my cell phone. Which makes me think I'm in real danger of losing a third thing -- my mind! I panicked about the credit card until I checked my bank account and found it hadn't been used by anyone else, so I cancelled it right away. I still haven't found it. I thought I knew the exact place I lost my cell phone because I had just take pictures of ghosts (Hallowe'en ones), but when I went there -- twice! --there was no sign of it. Had the ghosts made off with it. No. I finally found it buried under a pile of peanuts that I take with me to feed the squirrels. Now that third thing...it's under notice! It's really frustrating when you lose a cherished item or something you use everyday. However, the humor kicks in if you eventually find it in a most unusual place and think that there's no way you could have put it there....OH well...the trials and tribulations of getting older....sit back and enjoy the day. Loved your story. I'm so glad you found them. When I saw the squirrel picture I thought maybe he had taken them. You see, I have a dog that likes to hide things from me. Baby Girl is very good at it. The hardest part of retirement is spending so much time looking for things. When I was working, I did not have the time so I was much more organized. Now, I get side tracked constantly. That makes it harder to remember what I was looking for in the first place. I have found many things while I was looking for something else. Hope all works out with your credit card. Losing those is scary. Losing my mind is not so scary... I don't remember looking for it. I think that many seniors have the problem of temporary losing important things. My advice is to start practicing some meditation. It's the mind that's being stirred up too much. To get your laser beam focus and memory back I believe that meditation could work for you. Secondly, try putting these things away in the same place all the time. In the last 3 years I lost my debit card 3x and recently my cell phone for the first time. Luckily, my debit cards were never used (they're probably in the vehicle I totaled last year) and my cell phone was found in the pumpkin bin at Walmart from me diving into the box head first to find the best pumpkins. Chalk it up to age. Remember, if you still know what these items do, you're mind is OK. Losing them is normal as we age. Sheila: All my life I have" lost things" but now that I am at an advanced age ( much older than all of you) I have had to become scrupulously aware of where I put things. Never did that before. I put masking taped notes on my front door from the inside to remind me to have my cell phone etc.when I leave the house etc. I only have one prescription but I have to make sure it is in plain sight on the bureau when I get up in the morning and then leave it by my bedside table so I know I've taken it. My daughter and I went to Boston recently--I have a painting of mine on the wall of the Boston MA State House that is part of a Hall gallery of art from different state senator's offices representing their districts. We looked in on the artwork and were given a private tour by a chief of staff, and that was a lot of standing and walking but a wonderful experience. We had lunch afterward and it was a very long walk back to the car On the way home I began having intense leg pains. Luckily I had brought leg cramp medicine and Tylenol with me. But I had to swallow the pills with my daughters left over coffee from that morning which was barely enough to take the pills. Next time I'll have a bottle of water in the car when I go anywhere. I keep learning. I have never been notably efficient about things, but the aging process has forced me to be. And maybe it's about time. 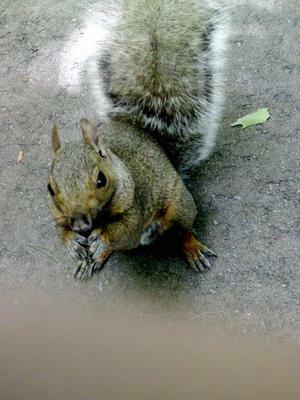 Maybe the Squirrel has your Credit Card?